This is one of the delicious dishes I learned to make a couple of weeks ago. 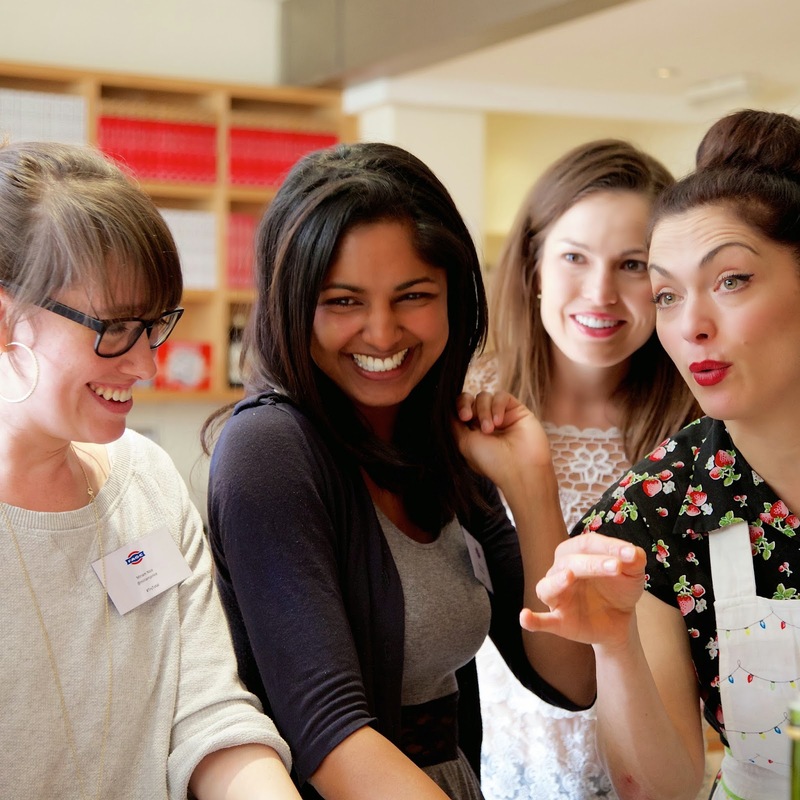 Together with a super-talented bunch of bloggers, we gleaned all this knowledge at the FAGE Total yoghurt masterclass with the wonderful Tonia Buxton, TV cook extraordinaire. 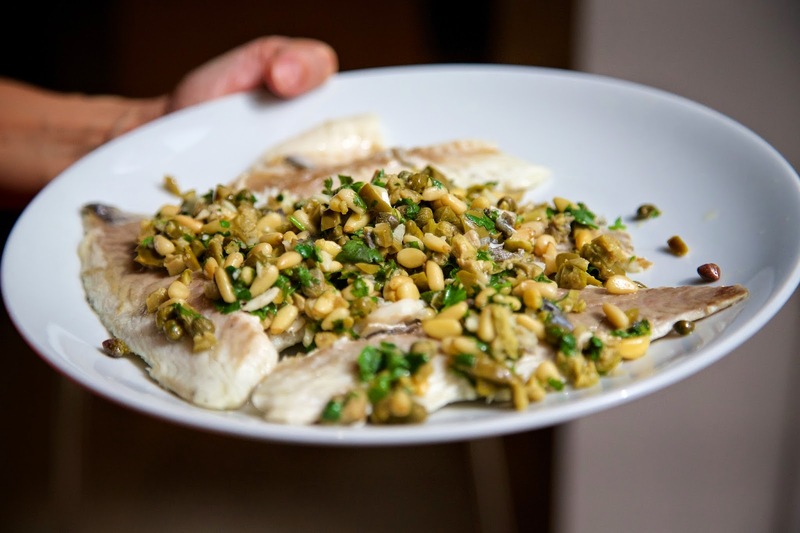 This light meal or starter is incredibly quick to make, nutritious and so delicious-it takes you to the Mediterranean with every mouthful. The beauty is in its simplicity, just let the ingredients do all the work for you. per portion for the tahini sauce. The trick is to be organised as this dish needs to be eaten pretty much straight from the pan. So, start by making the tahini sauce. Mix the tahini yoghurt sauce ingredients together. Here's Bailee doing a grand job. Once you're happy with the sauce, pop it to one side-or you can stand and look at it like Lucia did. Next, prepare the ingredients for the fish topping. 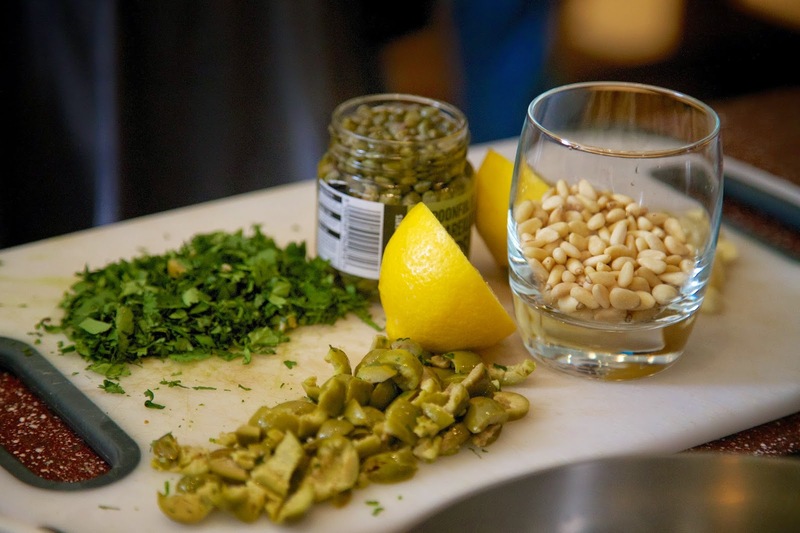 Chop the olives and coriander, slice the garlic thinly and measure out the pine kernels and capers. Bring all your prepared ingredients over to the hob as this dish comes together very quickly. Miriam had the steadiest hand so she carried ours! 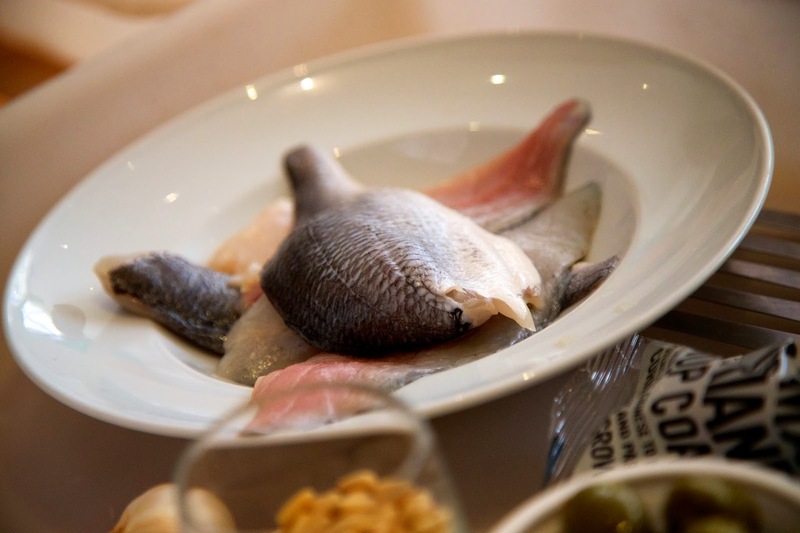 Don't be tempted to move the fish until it's cooked on one side or it will fall apart. The trick is, as soon as it doesn't stick to the pan, you can turn it. Selina cooked our fish under the expert guidance of teacher Tonia! 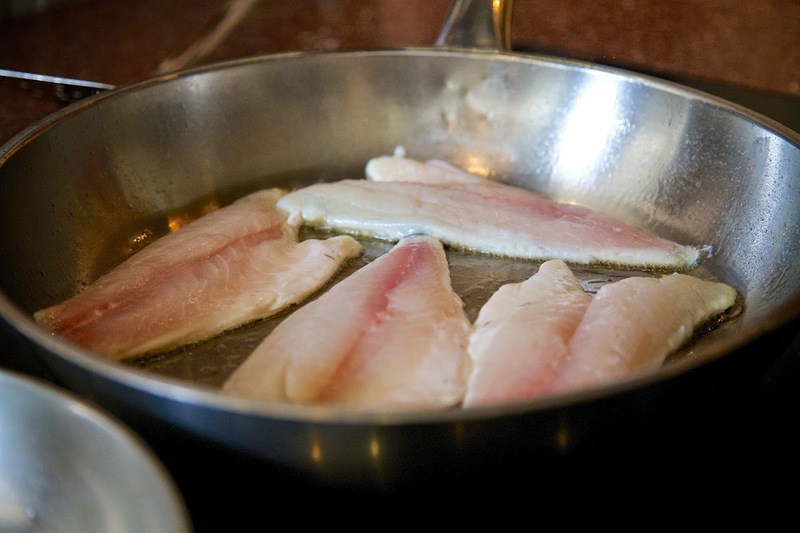 Divide into 4 equal portions and spoon generously over each cooked seabream. 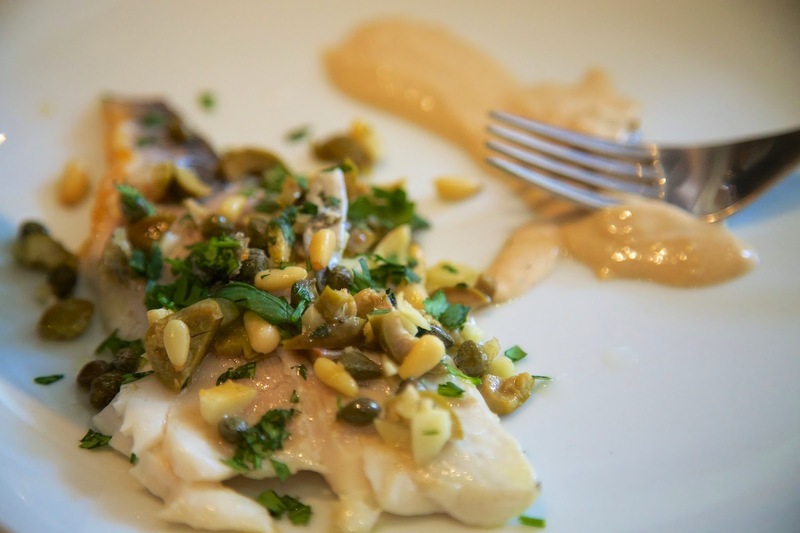 Spoon the tahini sauce over the fish or serve on the side.